Look at this special griddle for special meals! Cook up your favorite bacon and eggs, french toast or grilled cheese sandwiches on this handy Oster Digital Electric Griddle with Removable Plate that has an easy to clean surface. Digital temperature control Has "ready" and "preheat" indicators. Non stick cooking surface Ensures easy food release on flat griddle surface. Drip tray Is extra large to catch all grease or over runs of food. 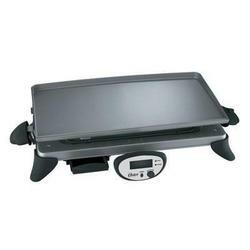 Skid-resistant feet Help stabilize griddle on counter top or table and hold it in place. Removable griddle plate Is handy for quick clean up. Large handles Are cool to the touch.